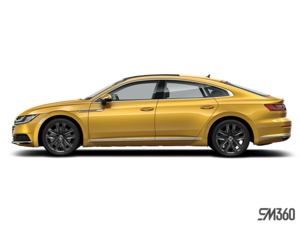 The much anticipated Volkswagen Arteon will officially be coming to North American shores and that is great news of for everyone who will soon be in the market for a high-end, stylish, modern sedan. VW’s new 4-door car straddles the line between luxury and practicality like only a VW can. This is one VW you’re going to want to keep at the top of your consideration list. Pretty much everyone can agree that the new VW Arteon is one good looking car. The Arteon has an aggressive and confident front end. Officially known as a “five-seat GT car”, it’s a big sedan that has a presence on the road. To suit your lifestyle, there will be two trim levels available to start with: Elegance, and R-Line which gives the Arteon a more sporty look. The hatchback design also gives you plenty of cargo space for road trips, or for the business person who uses their car as a second home. The Arteon has a spacious interior with comfortable back seats that can sit adults comfortably, so don’t be afraid to pick up a colleague on the way to the office. The Arteon will come with VW’s much lauded Digital Cockpit. Much more than an infotainment system, Digital Cockpit gives the driver control and access to an incredible assortment of information and vehicle features. A digital display replaces the traditional gauges and allows the driver to personalize the information they want to see. Along with an odometer and tachometer, you can display directions, fuel consumption stats, and receive important notifications, just to name a few possibilities. It allows you to truly personalize your driving experience. No arrival date has been announced yet for the Canadian market. Check back for updates on VW’s new flagship touring sedan.